#17 FLORIDA STATE 85, #4 NORTH CAROLINA 82 – It had been 20 years of ACC basketball and the Florida State Seminoles had not yet won an ACC tournament championship. That changed Sunday afternoon in Atlanta when FSU made a statement about becoming a basketball school with an impressive performance in a win over the #4 Tar Heels. All the Noles had to do was shoot almost 60% from the field, make 11 three-pointers on 50% shooting from behind the arc, withstand a determined UNC comeback and beat both Duke and North Carolina twice in the same season. No team had done the latter since 1993 when Georgia Tech defeated the Blue Devils and the Tar Heels twice in the same season. Tournament MVP Michael Snaer scored 18 points for Florida State while Harrison Barnes led North Carolina (29-5) with 23 points and Tyler Zeller had 19 points and 12 rebounds against the typically stingy Seminole defense. Unlike the 33-point FSU victory in January, this game when down to the wire as the Tar Heels, playing again without John Henson, nearly came all the way back from a 16-point deficit in the first half. Florida State hit 11 of 22 from three-point range, which turned out to be the difference. North Carolina went 5 of 20 from beyond the arc, including Kendall Marshall's potential game-winning shot with 5 seconds to go. It was only the second time in the last 16 years that a team other than North Carolina or Duke has won the ACC tournament. This one went to a school best known for football and its haunting chant and world famous barrister John Clark. Marshall hit a double clutch three-pointer with 30.1 seconds remaining to pull North Carolina within 83-82, and the Tar Heels had a chance to go for the win after Okaro White's 1-and-1 free throw clanked off the side of the rim. Instead of pounding the ball inside, a wide open Marshall elected to put up another trey with five seconds left. This one missed, the Seminoles rebounded and North Carolina quickly fouled. Marshall, who nearly had his third straight double-double of the tournament with 15 points and nine assists, tugged at his jersey with head down as he headed back down the court. On the final play, Zeller inbounded to Hairston at midcourt and he quickly called a timeout. Only six-tenths of a second went off the clock, and North Carolina inbounded again from a more favorable position. Hairston got a decent look at the tying shot, a long, straight-on 3. But it bounced off the side of the rim. Critics will fault UNC’s perimeter defense, but Florida State made outside and inside with North Carolina defenders in their face. They shot the ball brilliantly for almost the entire game. Like last year, the Seminoles looked primed to make a run deep into the NCAA tournament. 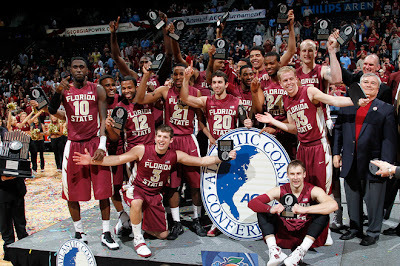 The 2010-11 Florida State team played into the Sweet Sixteen. North Carolina fans no doubt breathed a sigh of relief when the Tar Heels put up a fight outscoring and out rebounding the Seminoles in the second half. Down sixteen the game was looking dangerously close to the blowout that happened in Tallahassee. In the end, North Carolina simply couldn’t convert on a half-dozen key possessions. Freshmen P.J. Hairston who has thrown rocks at the rim for the entire ACC regular season made three straight shots from behind the arc to spark the Tar Heels’ comeback. Miami Headed To Second Straight N.I.T. 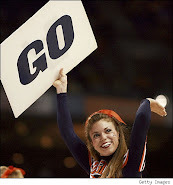 What The Heck Would Bobby Bowden Say?